My topic is adolescent spirituality (for a psychology course) so I have chosen the PsycINFO and PsycARTICLES databases. I have grouped related terms in each search box, using the OR connector. For more information about an article, select the title. In the full record display you will find the abstract (summary of the article). Click the folder icon in order to add it to your folder. Once you've selected your records, you can save, print, or export an entire folder. View your folder contents and select the articles and output options. View the full record display in order to get help with citing this article (APA, MLA, Chicago style). Select Permalink in the bottom right. A box with the permanent URL will appear at the top of the record. Click Sign In near the top of your screen (or the hamburger menu on a mobile device). Follow the steps to create an account with a password of your own choice. Once you have an account, you can save your search results into folders for future reference. You can share your folders with others (e.g. for group work). Inside your own account in MyEBSCO, click the New Folder icon. A window will open which asks you to provide a Folder Name, e.g. "Adolescent Spirituality"
Once you have created a new Folder, go back to My Folder. Select the articles you'd like to move. Click "Move To" and select your folder from the list that appears. Open the Tools and select Export. Then select the citation manager of your choice, e.g. Zotero or RefWorks. Select the JSTOR database ("Journal Storage") and go to the Advanced Search. You can filter (narrow) your results by item type (e.g. Articles), Date of publication, and Language. You can also narrow by subject discipline of the journals, e.g. Language & Literature. 1. Select Settings under the Collapse Menu Button. 2. 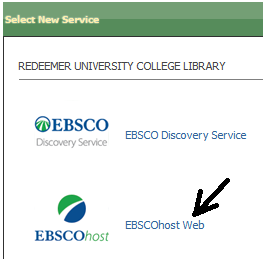 Select Library links and type Redeemer University College into the search bar. Check the box beside Redeemer University College Library - Find it at Redeemer. Select save. Try the following search. Notice the number of times an article was Cited by other authors.